South Africa, as with many countries across the continent, has a rapidly growing population. In addition, there is a significant gap between the rich and poor, resulting a huge need for social development and inclusive economic growth. The country has two potential paths with this expanding population – either create opportunities and prepare the growing work force to enter into employment, or become more reliant on diminishing government welfare and face the potential of increased unrest as demand outstrips supply. In KwaZulu-Natal, this is particularly relevant and is exacerbated by the rural nature of the landscape. A large proportion of the population live in rural areas and are reliant on nature to provide much of their basic needs such as food and water. This connection with nature comes at a risk. As unsustainable land-use practices and climate change degrade the landscape, the ability for natural resource provision from the environment deteriorates. This is clearly spelled out in several of the UNDP Sustainable Development Goals. The role of nature reserves and protected ecosystems is crucial for the mitigation of these impacts. In addition, these nature reserves also have the ability to provide economic opportunity to the people living alongside them. It is at this interface that Wildlife ACT’s Community Conservation Programme operates. Many of the people living adjacent to these protected areas only have a view across the fence – seeing wildlife as something out of their reach and in a negative light. This negative view is brought about by the perception that wildlife (considering that it is often relied upon as a source of meat) is legally inaccessible, with its harvest often resulting in arrest. It is therefore critical to change the reality of the situation by providing opportunities for such individuals to engage with wildlife and conservation – building a connection between people and nature. Wildlife ACT works on a tiered approach, providing a platform for primary school children to connect with nature on a fun, yet educational level through annual Bush Camps. Here, we aim to build an understanding of, and empathy with wildlife, along with a basic knowledge of conservation and opportunities within the sector. 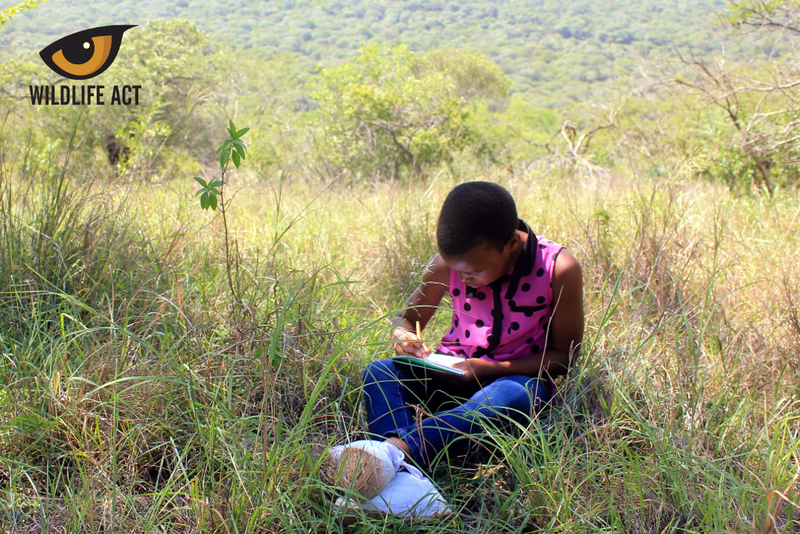 These kids enter high school and further engagement takes place through established Environmental Clubs where they are educated about the value of nature and how it provides basic ecological services. Throughout this period, our aim is to build an understanding of conservation and related enterprises – highlighting potential career opportunities for these children who traditionally have limited options available to them. The third phase is to provide more formalized conservation Ambassador Clubs for those individuals finishing school and with an appetite to enter the field of conservation. Here, locally-based facilitators provide lessons on various nature-based subjects along with career guidance on conservation. The purpose is to provide a self-learning platform for the inspired youth to focus on and follow a career path. By showcasing options available, working to remove barriers, and providing guidance on how to pursue those opportunities, the world of wildlife becomes more open – with success a possibility previously only accessible to a few. Please follow the link below if you would like to help support this ongoing work.